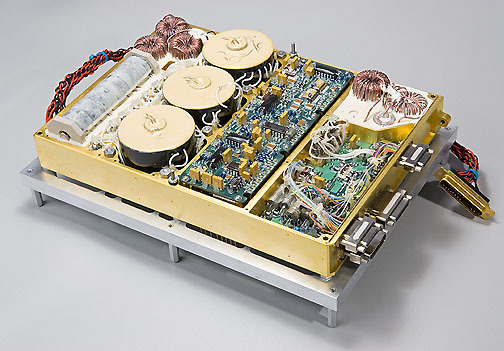 Top view of the PS module after completion of testing and closeout (mounted on its GSE support frame). The PS consists of a Backbone, Control assembly and Power MosFet assembly integrated into a single package containing over 800 electronic parts plus 37 transformers and magnetic assemblies. Total power provided is 240 watts divided between 26 outputs. There are 4 independent drive systems operating off of 2 separate MSL power bus circuits. 3 of the main transformers and the control assembly are visible in the middle 2 compartments. The many parts that are above the frame are designed to protrude into the VH module cavity discussed in Photo 4.